CHILE: As growing interest in electric cars and energy-storage drives up global demand for lithium, companies with concessions to exploit Chile's vast resources could find themselves in an enviable position if the government loosens restrictions. Dubbed "white petroleum", lithium is critical to the global switch to cleaner energy and transport, so exploiting new reserves of the mineral with low extraction costs is becoming imperative. The tiny rechargeable batteries found in every smartphone and laptop currently account for the largest source of demand for the metal. But over the next decade, China-led demand for electric vehicles is expected to drive overall lithium demand by 10% a year. While lithium-ion battery prices have more than halved in recent years, the downward trajectory will need to continue if electric cars are to become mainstream and renewables-supporting stationary energy-storage systems are commercialised further. China mines about 6% of global lithium demand, but holds about 13% of world lithium reserves. The price of lithium carbonate used in the production of lithium-ion batteries tripled in China in 2015 and has continued to rise in 2016, according to industry consultancy Asian Metals, driven by growing sales of electric vehicles. Australia accounts for 40% of current lithium production, but has just 3% of reserves, and lithium ore is mined from hard rock. Latin America holds the keys to unlocking more of the world's lithium reserves to satiate projected demand for lithium-ion batteries. Deposits are to be found in the high Andes mountains. Between them, Chile, Argentina and Bolivia, known as the "lithium triangle", sit on three quarters of the world's lithium reserves. Lithium from Chile, the main producer after Australia, costs least to produce, around $2,000/tonne, versus hard-rock mining at about $5,000/tonne. In the lithium triangle, the metal is found in saltwater deposits. The lithium-rich brine is pumped into ponds to evaporate, using the sun's energy, a free and abundant resource. Two firms have dominated lithium exploration in Chile: domestic chemicals producer Sociedad Quimica y Minera (SQM) and US firm Albemarle Corporation, through its acquisition of Rockwood Holdings. Both have production plants in the Atacama Salar salt flat in northern Chile, which has the world's highest grade and largest producing lithium-brine deposit and accounts for about a third of global lithium output. 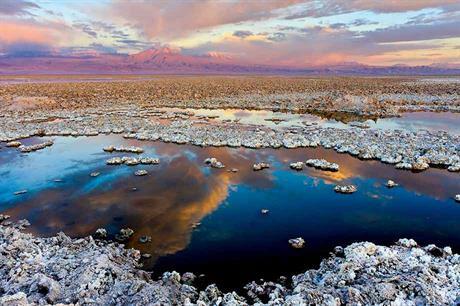 Atacama Salar's evaporation rate is the highest in the lithium industry, a key factor in lithium production costs. Despite being one of the biggest lithium producers in the world, Chile is the only country that has declared lithium a non-concessible strategic mineral of national interest, meaning lithium can only be exploited by the state. However, SQM was granted concessions in the 1970s under the Pinochet regime. Rockwood, before its acquisition by Albemarle, secured a concession through state-owned production development corporation Corfo. Mismanagement by successive governments since the 1970s and corruption scandals have hampered the growth of Chile's lithium sector. Compared with Chile's copper industry, which recorded exports worth $40 billion of the metal in 2014, lithium-mining exports that same year totalled just $226 million. Two years ago, Chile's president, Michelle Bachelet, set up the Chilean National Lithium Commission (NLC), which decided that lithium should remain a strategic mineral due to the metal's potential in the global battery industry. "There are encouraging signs that the government wants to open up lithium export markets, and these efforts to open up opportunities is attracting foreign investment," said Hendrik van Alphen, CEO of Wealth Minerals, a junior mineral-resource exploration company. The Canadian firm has been consolidating various concessions this year, resulting in a large lithium-brine property package that includes property in the Atacama Salar, spanning more than 150 concessions, agreements that grant exploration rights, and covering over 40,000 hectares. The involvement of juniors such as Wealth Minerals in Chile's lithium mining industry could help expedite the exploitation of the country's lithium reserves by mopping up multiple idle claims to explore resources. Concessions can be sat on, often for years, without the holder being required to explore them with the view to exploiting their resource, a situation unique to Chile, according to van Alphen. Mining juniors and exploration companies will acquire concessions and explore their resources, and usually sell the concessions on to a mining company. Between 2012 and 2015 Wealth Minerals' stock value barely rose above $0.40. In September it peaked at $1.28. Van Alphen says within the next four to five years lithium production could start at Wealth Minerals' concessions. The company's own operations may also evolve, into lithium extraction. "At this stage we are on the look out for other targets that have lithium resources, which may lead to an actual acquisition." Lithium activity in Argentina is also warming up, with Albemarle recently signing an agreement for exclusive exploration rights in what is potentially the country's largest resource. Earlier this year, SQM paid for a lithium stake in Chile's neighbour. While this is all good news for the lithium-ion battery industry across the Pacific, Chile must act if it is not to lose out as a lithium major in the global battery boom.